Breathtaking artwork inspired by Star Wars: The Force Awakens. Hand-numbered limited edition of only 125 pieces! Each paper print comes with a certificate of authenticity. Measures 19-inches wide x 13-inches tall. 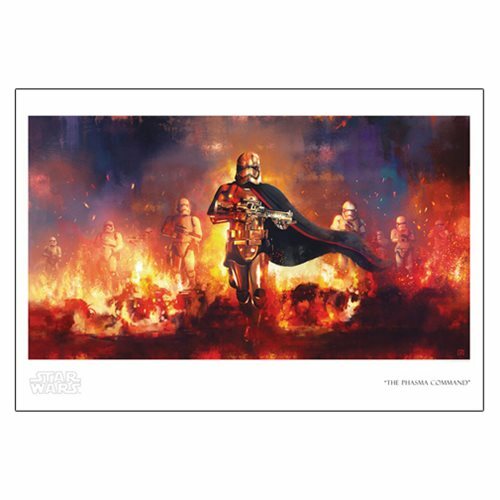 Captain Phasma and her First Order Stormtroopers make their presence felt in a big way in this breathtaking Star Wars Star Wars The Phasma Command by Akirant Paper Giclee Art Print. The Phasma Command by Akirant features artwork inspired by Star Wars: The Force Awakens. An unframed limited edition of only 125 hand-numbered pieces, it measures 19-inches wide x 13-inches tall (image size 18-inches x 9 1/10-inches). Each paper print comes with a certificate of authenticity.